■ Take a Hakodate City Tram in front of Hakodate Station and get off in front of Goryokaku Park and walk for about 15 minutes. ■ Take a Hakodate Bus in front of Hakodate Station and get off at Goryokaku and walk for about 15 minutes. ■ Take a Hakodate Bus in front of Hakodate Station and get off at the entrance to Goryokaku Park and walk for about seven minutes. 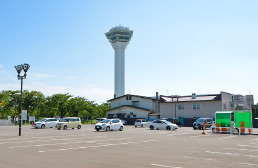 ■ Take a Hakodate Bus Goryokaku Tower and Trappistine shuttle bus and get off at Goryokaku Tower and walk for 30 seconds. ■ Take Hakodate Bus No. 89 and get off at the entrance in front of Goryokaku Park and walk for about seven minutes. ■ Take a JR train from Shin-Hakodate-Hokuto Station to Hakodate Station. Click here for access from JR Hakodate Station. ■ Take a Hakodate Teisan Bus from Shin-Hakodate-Hokuto Station and get off at the entrance to Goryokaku Park and walk for ten minutes. ■ Take a Hokkaido Kanko Bus from Shin-Hakodate-Hokuto Station and get off at the entrance in front of Goryokaku Park and walk for ten minutes. ■ Take a Hakodate Bus from Shin-Hakodate-Hokuto Station and get off at the entrance to Goryokaku Park and walk for ten minutes. ■ Take a Hakodate Bus non-stop bus to the Goryokaku Area, Tobikko, and get off at the entrance to Goryokaku Park and walk for seven minutes. ■ Take a Hakodate Bus Goryokaku Tower and Trappistine shuttle bus and get off in front of the Goryokaku Tower and walk for 30 seconds. ■ Take a Hakodate Bus No. 100 (Airport-Goryokaku Rapid Line) and get off in front of the Goryokaku Tower and walk for 30 seconds. ■ Take a Hakodate Bus No. 16 and get off at Goryokaku and walk for about 15 minutes. *Timetables and fares are subject to change without prior notice due to the revision of timetables and fares. Please check with a transportation company before use. Goryokaku Tower does not have parking facilities for private cars. 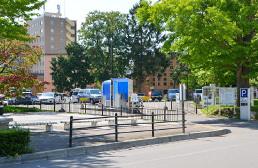 When you are visiting by car, please use the following pay parking in the vicinity of the Goryokaku Tower. We apologize for the inconvenience. Parking fee: 200 yen for up to an hour. 100 yen for each additional 30 minutes. *Please note that the customers visiting the Hakodate Performing Arts Center, Hakodate City Northern Pacific Fishery’s Document Museum, and the Hakodate Museum of Art, Hokkaido, receive free parking for up to two hours. Please have your parking ticket validated at the information desk of each facility. Hakodate Municipal Goryokaku Sightseeing Parking (pay parking) located across the street from the Hakodate City Central Library. Approx. 15 min by car. Approx. 30 min by Hakodate City Tram. Approx. 20 min by Hakodate Bus. Approx. 10 min by car. Approx. 20 min by car. Approx. 25 min by car. Approx. 40 min by car.